I am more than happy and blessed to represent Miyakonojo Higashi High School during the recent speech contest held in Miyazaki City. I was overwhelmed and I thought that I couldn’t make it, but I did! Thanks to everyone who believed and supported me, especially my speech training mentors. I have received the following positive feedbacks after winning the competition, “Wow! Great speech and you were passionate.”, “Radiant delivery! Perfect intonation and powerful smile. Amzing job!”, “Wonderful smile and perfect delivery! You are gifted in public speaking.”, “Well done!”. These comments were like a great reward for me and my school. 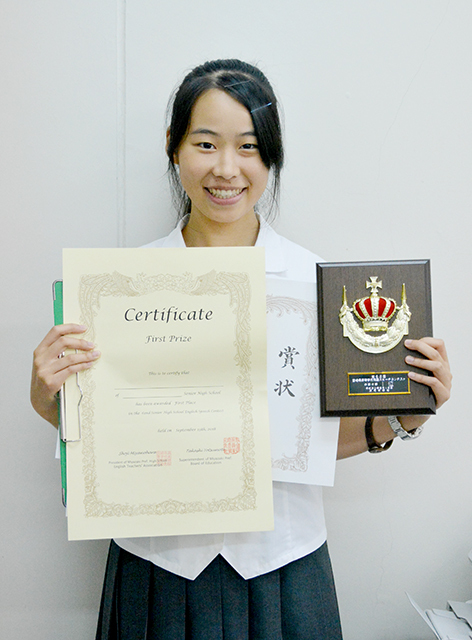 I’ll do my very best and triumph another speech competition! Thank you so much to Miyakonojo Higashi High School for teaching, molding and preparing us to be a globally-competent individual in the future! Winning various speech contests was never easy. It has been a great challenge, yet humbling and fulfilling. I have experienced rigorous speech trainings and this has been my foundation in public speaking. I am proud to be one of the alumni of Miyakonojo Higashi High School. When I started studying in MHHS, I have learned a lot not only about my chosen course, but also the importance of global education. Miyakonojo Higashi High School provides quality education and educators, creating educational opportunities both locally and internationally. Miyakonojo Higashi High School has been setting a high standard in academics, technical-vocational tracks, co-curricular and extra-curricular activities. Because of these, I was able to achieve my goal. I am grateful to my mentors and teachers for believing in me. I am glad that my senior high school has been acing speech contests and I hope it will level up as the years go by. Copyright(c) MIYAKONOJO HIGASHI.All Rights Reserved.